Martin Edward Schottenheimer (/ˈʃɒtənhaɪmər/; born September 23, 1943) is a former professional American football player and coach who served as a head coach in the National Football League (NFL) for 21 seasons. He was the head coach of the Kansas City Chiefs for 10 seasons, the Cleveland Browns for five seasons, the San Diego Chargers for five seasons, and the Washington Redskins for one season. Eighth in all-time wins at 205 and fifth in regular season wins at 200, Schottenheimer has the most wins of a head coach to not reach an NFL championship and the second most of non-championship winning head coaches. After coaching in the NFL, he won a 2011 championship in his one season with the Virginia Destroyers of the United Football League (UFL). Schottenheimer was born in Canonsburg, Pennsylvania. He attended high school at Fort Cherry High School in McDonald, Pennsylvania. After attending the University of Pittsburgh, Schottenheimer, a linebacker, was selected in the fourth round of the 1965 NFL Draft by the Baltimore Colts and in the seventh round of the 1965 American Football League draft by the Buffalo Bills. He signed with the Bills and spent the next four (1965, 1966, 1967, and 1968) seasons with Buffalo, including the Bills' 1965 AFL Championship season, when he was selected to the AFL All-Star Team. Schottenheimer was still with the team during the 1969 preseason and intercepted two passes in a game against the Houston Oilers. Some time between the 1969 preseason and regular season, Schottenheimer was sent to the Boston Patriots and spent the next two seasons with the Pats. He was traded to the Pittsburgh Steelers in 1971 but was traded again to the Colts before the beginning of the 1971 season. He retired from football in 1971 and spent the next several years working in the real estate industry. Schottenheimer credits his professional playing career as being his inspiration for coaching. Schottenheimer came out of retirement in 1974 to sign with the Portland Storm of the World Football League as a player-coach. He injured his shoulder prior to the start of the season, but stayed on with the Storm as their linebackers coach. Schottenheimer's professional coaching career began in 1974 when he became linebackers coach for the Portland Storm of the World Football League. In 1975, he was hired as a linebackers coach for the NFL's New York Giants and in 1977 became defensive coordinator. Schottenheimer spent 1978 and 1979 as the linebackers coach for the NFL's Detroit Lions. In 1980, he was hired as the defensive coordinator for the Cleveland Browns. On October 22, 1984, Schottenheimer replaced Sam Rutigliano as Browns head coach, after an October 7 game against the New England Patriots that bore an eerie resemblance to Cleveland's 1980 playoff loss to the Raiders, known as Red Right 88. The Browns were down 17–16 in the fourth quarter, and lost on an interception in New England's end zone as time expired. Chants of "Goodbye Sam" rung out from the stands after the New England game. Browns' owner Art Modell called the play-calling "inexcusable" and fired Rutigliano two weeks later. The 1–7 Browns then went 4–4 under Schottenheimer to finish the season with a 5–11 record. The selection of University of Miami quarterback Bernie Kosar in 1985's supplemental draft ushered in a new, largely successful era for Cleveland. With Schottenheimer, Kosar and a cast of talented players on offense and defense, the team reached greater heights than Rutigliano and former quarterback Brian Sipe ever did. Though they became consistent playoff contenders in this era, the Browns did not reach the Super Bowl, falling one win short three times in the late 1980s. While not stellar, the Browns' record won first place in a weak AFC Central in 1985, and the team looked poised to shock the heavily favored Miami Dolphins in a divisional playoff game on January 4, 1986. Cleveland surged to a 21–3 halftime lead, and it took a spirited second-half comeback by Dan Marino and the Dolphins to win it 24–21 and end the Browns' season. Despite the loss, many people expected Cleveland to be back the following year. "The Browns' days, the good days, are here and ahead of us", radio personality Pete Franklin said. Despite a tumultuous off season, 1986 marked Cleveland's entry into the ranks of the NFL's elite as Kosar's play improved and the defensive unit came together. Kosar threw for 3,854 yards to a corps of receivers that included Brian Brennan, Newsome and rookie Webster Slaughter. On defense, cornerbacks Frank Minnifield and Hanford Dixon emerged as one of the NFL's premiere pass-defending duos. After a slow start, the Browns rose to the top of the divisional standings, twice beating the Pittsburgh Steelers and ending a 16-game losing streak at Three Rivers Stadium. A 12–4 record earned Cleveland home-field advantage throughout the playoffs. The Browns' first opponents in the 1986 playoffs were the New York Jets. Kicker Mark Moseley made a field goal and won the game for the Browns 23–20. It was the team's first playoff victory in 17 years. The following week, the Browns matched up against the Denver Broncos in the AFC Championship game in Cleveland. Denver got out to an early lead, but Cleveland tied the game and then went ahead 20–13 in the fourth quarter. After the ensuing kickoff, the Broncos were pinned at their own 2-yard line with 5:32 remaining. Denver quarterback John Elway then engineered a 98-yard drive for a touchdown with the cold, whipping wind in his face. "The Drive", as the series came to be known, tied the score and sent the game into overtime. Cleveland received the ball first in the sudden-death period but was stopped by the Denver defense. On Denver's first possession, Elway again led the Broncos on a long drive ending with a Rich Karlis field goal that sailed just inside the left upright and won the game. The drive that tied the game has since come to be seen as one of the best in playoff history, and is remembered by Cleveland fans as a historic meltdown. Although downtrodden by 1986's playoff defeat, Cleveland continued to win the following season. The Browns finished with a 10–5 record in 1987 and won the AFC Central for the third year in a row. In the divisional playoff round, the Browns faced the Indianapolis Colts and won 38–21. The win set up a rematch with the Broncos in the AFC Championship in Denver. The Broncos held a 21–3 lead at halftime, but a pair of rushing touchdowns and another by receiver Reggie Langhorne brought Cleveland to within seven points. Cleveland scored again in the fourth quarter, but the Broncos went ahead again by seven points on a touchdown with four minutes left. After Denver's kickoff, Kosar and the offense reached the Broncos' eight-yard line with 1:12 remaining. Kosar handed the ball to Earnest Byner on a second down. Byner ran left and broke inside with a clear path to the end zone, but was stripped by Denver's Jeremiah Castille just before crossing the goal line. The Broncos ran down the clock before intentionally taking a safety and winning 38–33. "The Fumble" quickly entered the lexicon of the Browns' modern-era disappointment, just as The Drive had a year before. The 1988 season was marred by injuries to the Browns' quarterbacks. But despite the rotating cast of quarterbacks, Cleveland managed to finish with a 10–6 record and made the playoffs as a wild-card team. Cleveland met the Houston Oilers in the wild-card playoff round at home, and soon found themselves attempting to win with third-string quarterback Mike Pagel after an injury to second stringer Don Strock. Pagel put up a valiant effort, but the team lost the game 24–23. Four days after the Oilers loss, Schottenheimer and Modell announced that the coach would leave the team by mutual consent. Modell felt hiring an offensive coordinator was necessary to keep pace with the Oilers and the Bengals, a pair of divisional opponents then on the rise, but Schottenheimer said it "became evident that some of the differences we had, we weren't going to be able to resolve." Schottenheimer remained with the Browns until 1988, amassing a 44–27 (.620) regular-season record and a 2–4 (.333) mark in the playoffs, including four playoff appearances, three AFC Central Division titles, and two trips to the AFC Championship Game (both against the Denver Broncos). Kansas City Chiefs' general manager Carl Peterson named Schottenheimer head coach on January 24, 1989. In 1990, Schottenheimer's Chiefs got out of the starting gate quickly, winning three of their first four games. The club then struggled, splitting its next six contests. In an inspiring Veterans Day performance against Seattle, the Seahawks miraculously won, 17–16. That loss brought on the furious stretch run which saw the club record victories in six of its last seven outings. The Chiefs clinched their first post-season berth since 1986 with a 24–21 win at San Diego and finished the year at 11–5, marking the franchise's best finish since 1969. The Chiefs suffered a heart-breaking, 17–16 loss at Miami on January 5, 1991 in an AFC Wild Card Game. A 27–21 victory against the Los Angeles Raiders in the 1991 regular season finale gave the Chiefs the right to host the Raiders just six days later in the inaugural post-season game in Arrowhead's history, and the Chiefs' first home playoff game in 20 years. Thanks to six Los Angeles turnovers, the Chiefs registered their first post-season victory since Super Bowl IV with a 10–6 win in an AFC Wild Card Game on December 28. The following week, the Chiefs lost a 37–14 decision at Buffalo on January 5, 1992 in an AFC Divisional Playoff match-up as the Buffalo Bills' dynamic offense proved to be too much for the Chiefs. The Chiefs got off to a 3–1 start in 1992, but was faced with a 4–4 record at the season's midpoint. Despite four consecutive victories, the club's post-season hopes still came down to the season's final contest. Owning a 9–6 record and needing one more victory to secure a playoff berth, the Chiefs defense tallied three touchdowns, as Kansas City claimed a 42–20 win against Denver to finish the season at 10–6. Despite the big win against the Denver Broncos, the Chiefs made a quick exit from the playoffs as quarterback Dave Krieg was sacked 7 times in a 17–0 AFC Wild Card loss against the San Diego Chargers on January 2, 1993. The Chiefs spent the 1993 off-season installing the "West Coast offense" under the direction of new offensive coordinator Paul Hackett, who at one time served as quarterbacks coach to Joe Montana in San Francisco. On April 20, the Chiefs traded for Joe Montana, who directed the 49ers to four Super Bowl victories in the previous decade. On June 9, the club signed unrestricted free agent running back Marcus Allen, who had spent 11 seasons playing against the Chiefs as a member of the rival Raiders. Montana and Allen made their debuts in a 27–3 win against the Tampa Bay Buccaneers on September 5, marking Montana's first Opening Day appearance since 1990. Before taking the field in a Sunday night contest at Minnesota on December 26, the team learned it had clinched its first AFC West title since 1971 thanks to a Raiders loss earlier in the day. The team finished the season with an 11–5 regular season record, marking the club's fourth consecutive year with a double-digit victory tally. Kansas City got its first true taste of "Montana Magic" as the Hall of Fame passer engineered a brilliant comeback in a 27–24 overtime win in an AFC Wild Card thriller against the Pittsburgh Steelers on January 8, 1994. Next, the Chiefs traveled to the Astrodome to face the red-hot Houston Oilers, who had won 11 straight games to conclude the regular season. The heavily favored Oilers opened up a 13–7 lead in the fourth quarter, but once again, Montana conjured a comeback, guiding the club to a 28–20 victory. The Chiefs playoff journey ended as the club made its initial AFC Championship Game appearance against the Buffalo Bills on January 23. Montana was knocked out of the contest early in the second half as Buffalo claimed its record fourth straight AFC title by a score of 30–13. After starting the 1994 season 3–0, the Chiefs dropped back-to-back games before snapping an 11-game losing streak against Denver at Mile High Stadium on October 17 in a memorable Monday night contest. The Chiefs found themselves at 8–7 faced with a do-or-die regular season finale against the Raiders. At 9–7, Kansas City qualified for the playoffs for a fifth straight season. However, the Chiefs made a rapid departure from the playoffs in Montana's final professional contest at Miami on New Year's Eve. Montana and Dolphins' quarterback Dan Marino conducted a masterful first-half duel that ended deadlocked at 17–17, but Miami eventually prevailed by a 27–17 count. Montana announced his retirement from football after 16 years in the NFL on April 18, 1995 and Steve Bono was promoted to the starting job. Immediately, the media predicted much gloom and doom for the 1995 Chiefs under Bono, leading Schottenheimer to quip during training camp that his club had been picked "sixth in a five-team division". Led by Bono, who merited a Pro Bowl berth, Kansas City posted an NFL-best 13–3 record with unblemished 8–0 marks in the AFC West and at Arrowhead. The Chiefs led the NFL in rushing offense (138.9 ypg), scoring defense (15.1 ppg) and turnover ratio (+12). A 24–3 win at Arizona on October 1 featured a surreal, 76-yard TD run on a bootleg by Bono as the Chiefs initiated a seven-game winning streak, the franchise's longest since 1969. Kansas City clinched a division title with a 29–23 victory at Oakland on December 3 en route to a franchise-best 13–3 regular season record and a team-record sixth consecutive postseason berth. The Chiefs were represented by seven players in the Pro Bowl, more than any other AFC team. In the playoffs, the Chiefs dropped an AFC Divisional Playoff Game against the underdog Indianapolis Colts on January 7, a blustery afternoon with the temperature at 11 degrees and a wind chill of −9. Three interceptions and three missed field goals from placekicker Lin Elliot contributed to the 10–7 loss at Arrowhead. Kansas City entered the 1996 campaign with essentially the same lineup as the club boasted in 1995 and were featured on the cover of Sports Illustrated along with Green Bay as pre-season Super Bowl favorites. The club started the season with a 4–0 record for the first time in team history, but the season's lofty expectations came crashing down as the squad lost three of its next four games. A three-game winning streak, including a victory over the eventual Super Bowl champion Green Bay Packers, put the club back in post-season contention at 8–3. Needing just one more win to qualify for the playoffs, the Chiefs dropped their next two games: a 24–19 loss against Indianapolis and a 20–9 loss to the Bills. The Chiefs finished with a 9–7 record, missing the postseason for the first time since 1989 after the AFC's final Wild Card spot went to the Jacksonville Jaguars, who won a tiebreaker with Kansas City. Kansas City dramatically retooled its roster in 1997, beginning with the signing of free agent quarterback Elvis Grbac on March 17. In addition to Grbac, the Chiefs lineup featured 11 new starters. All the new faces quickly formed a cohesive unit as the Chiefs posted a 13–3 record, an 8–0 Arrowhead record and their second AFC West title in three years. The Chiefs led the NFL in scoring defense, allowing a mere 14.5 points per game. The 232 total points permitted by the Chiefs in 1997 were the lowest tally ever allowed in a 16-game season in team history. Kansas City also broke a 63-year-old mark owned by the 1934 Detroit Lions by not permitting a second-half TD in 10 consecutive games. Grbac returned for the regular season finale against New Orleans Saints on December 21 as the squad finished the year with six consecutive victories, a first in team history. The Chiefs' 13–3 record gave them home field advantage throughout the AFC Playoffs. However, their playoff run was short-lived, as Kansas City lost to the eventual Super Bowl champion Denver Broncos 14–10 in the Divisional round. The following year, with Elvis Grbac back at the helm, the Chiefs fell to 7–9 in 1998. 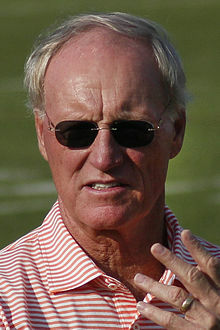 Marty Schottenheimer took much of the blame for his failed attempts in the playoffs and conservative style of coaching ("Martyball"), and resigned following the 1998 season. Schottenheimer spent a total of 10 seasons as head coach of the Kansas City Chiefs, from 1989 to 1998 recording a 101–58–1 regular season record (.634) and had three division titles, seven playoff appearances, and a trip to the AFC Championship game in 1993, losing to the Buffalo Bills. After working as a football analyst for ESPN from 1999 to 2000, Schottenheimer was hired as head coach of the Washington Redskins for the 2001 season. Schottenheimer's Redskins became the first team in NFL history to win five consecutive games immediately after losing its first five games. One of the Redskins loses was a 13–45 loss to Schottenheimer's former team, the Chiefs. The Redskins won eight of their final eleven games to narrowly miss the post season. Despite this, in a controversial move, Daniel Snyder, the owner of the Redskins, fired Schottenheimer on January 13, 2002 after just one 8–8 season to make room for former University of Florida head coach Steve Spurrier. The San Diego Chargers hired Schottenheimer as their 13th head coach on January 29, 2002. Schottenheimer posted a 47–33 record (.588) with the Chargers. His success didn't come immediately, as the team posted a 4–12 record in 2003, thereby "earning" the first overall pick in the draft. He was named NFL Coach of the Year for the 2004 NFL season after the Chargers went 12–4 and won the AFC West. Schottenheimer led the team to two playoff appearances, his 12th and 13th as a head coach. However, both appearances resulted in disappointing losses; to the underdog New York Jets in overtime in 2005, and to the New England Patriots in 2007, bringing his playoff record to 5–13. 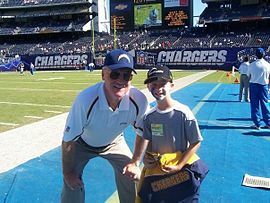 Schottenheimer with a Chargers fan during his tenure as San Diego's coach. Schottenheimer was abruptly fired by San Diego on February 12, 2007. Reasons for his firing include a strained relationship with general manager A.J. Smith, which reached a breaking point when four assistants (Cam Cameron, Wade Phillips, Rob Chudzinski and Greg Manusky) left for positions with other teams. These coaches all left to pursue higher-level opportunities with other teams, which cannot be prevented by the team they are leaving under NFL rules; two of them became head coaches, instead of merely making a lateral move to the same position with another team. Jim Trotter, of the San Diego Union Tribune, also believes that Schottenheimer's insistence that his brother, Kurt Schottenheimer, replace Phillips as the defensive coordinator further strained the relationship between team president Dean Spanos and Schottenheimer. Spanos had always been against the idea of allowing relatives to be on the same coaching staff, even though Schottenheimer's son Brian was the Chargers' quarterbacks coach. Schottenheimer even went as far to book a flight to San Diego for his brother, Kurt, against Spanos's wishes. This act of defiance increased the gap between Spanos and Schottenheimer. Dean Spanos released a statement saying "Our fans deserve to know what changed for me over the last month. When I decided to move ahead with Marty Schottenheimer in mid-January, I did so with the expectation that the core of his fine coaching staff would remain intact. Unfortunately, that did not prove to be the case, and the process of dealing with these coaching changes convinced me that we simply could not move forward with such dysfunction between our head coach and general manager. In short, this entire process over the last month convinced me beyond any doubt that I had to act to change this untenable situation and create an environment where everyone at Charger Park would be pulling in the same direction and working at a championship level. I expect exactly that from our entire Charger organization in 2007." Schottenheimer was still owed $4 million for the final year of his contract, as the firing was "without cause". Schottenheimer was replaced as San Diego head coach by Norv Turner—coincidentally the last full-time head coach the Redskins had before Schottenheimer's arrival. Following the Chargers' subsequent 1–3 start the next season, fans at Qualcomm Stadium voiced their displeasure with the firing by chanting "Marty! Marty! Marty!" Schottenheimer's tenure as an NFL head coach concluded with 205 wins, which are the most of head coaches to not reach an NFL championship, the most of former head coaches to not win an NFL championship, and the second most of non-championship winning NFL head coaches behind Andy Reid. His 200 regular season wins are also the most of NFL head coaches to not reach and win a championship. In his NFL coaching career, 17 coaches have been hired by teams that previously employed him, with all but the Chargers and Chiefs having a losing record and none advancing to a Super Bowl title in their post-Schottenheimer eras. In March 2011, the Virginia Destroyers hired Schottenheimer to be their first head coach and general manager, at the age of 67. In order to lure Schottenheimer to the Destroyers, league majority owner William Hambrecht personally guaranteed he would pay Schottenheimer's $1.1 million salary for the eight-game season. He led the Destroyers to a 4���1 record in the shortened 2011 regular season, earning a playoff berth with home-field advantage in his first season. Schottenheimer's efforts earned him the 2011 United Football League Coach of the Year award. His starting running back, Dominic Rhodes, was also named the MVP of the 2011 UFL season. On October 21, 2011, the Virginia Destroyers derailed the two-time defending UFL Champion Las Vegas Locomotives 17–3 in the 2011 UFL Championship Game at the Virginia Beach Sportsplex. It was Schottenheimer's first ever championship as a coach. Schottenheimer abruptly resigned from the Destroyers shortly before the 2012 season, citing discomfort over unspecified issues facing the team that season and the failure of the team to meet also-unspecified conditions for his return. Schottenheimer later sued Hambrecht after not receiving any of the money he was owed. He received a settlement of approximately $800,000 in the lawsuit. Soon after being replaced in 2007 as head coach of the San Diego Chargers, he was hired by ESPN to work as an NFL Insider on the network, returning to a role he had served in between his coaching stints with the Kansas City Chiefs and the Washington Redskins. He later appeared on SportsCenter and NFL Live. Schottenheimer has been married to his wife, Pat, since 1968. They live on Lake Norman in North Carolina. They have two children, a daughter, Kristen and a son, Brian, who is the Offensive coordinator for the Seattle Seahawks. Marty's younger brother Kurt was also a coach in the NFL. In 2011, Schottenheimer was diagnosed with Alzheimer's disease. By the time the diagnosis was announced publicly in 2016, it had progressed slowly and he still maintained much of his memory and function, and he was about to begin experimental treatment to slow the progression of the disease even further. 8 8 0 .500 1st in AFC Central 0 1 .000 Lost to Miami Dolphins in Divisional Game. 12 4 0 .750 1st in AFC Central 1 1 .500 Lost to Denver Broncos in AFC Championship Game. 10 5 0 .667 1st in AFC Central 1 1 .500 Lost to Denver Broncos in AFC Championship Game. 10 6 0 .625 2nd in AFC Central 0 1 .000 Lost to Houston Oilers in AFC Wild-Card Game. 11 5 0 .688 2nd in AFC West 0 1 .000 Lost to Miami Dolphins in Wild Card Game. 10 6 0 .625 2nd in AFC West 1 1 .500 Lost to Buffalo Bills in Divisional Game. 10 6 0 .625 2nd in AFC West 0 1 .000 Lost to San Diego Chargers in Wild Card Game. 11 5 0 .688 1st in AFC West 2 1 .667 Lost to Buffalo Bills in AFC Championship. 9 7 0 .563 2nd in AFC West 0 1 .000 Lost to Miami Dolphins in AFC Wild-Card Game. 13 3 0 .813 1st in AFC West 0 1 .000 Lost to Indianapolis Colts in AFC Divisional Game. 13 3 0 .813 1st in AFC West 0 1 .000 Lost to Denver Broncos in AFC Divisional Game. 12 4 0 .750 1st in AFC West 0 1 .000 Lost to New York Jets in AFC Wild-Card Game. 14 2 0 .875 1st in AFC West 0 1 .000 Lost to New England Patriots in AFC Divisional Game. Schottenheimer was never able to win a Super Bowl championship as a head coach, but three of his former assistant coaches won Super Bowl as head coaches: Cowher with the Steelers in 2005; Dungy with the Colts in 2006; and McCarthy with the Packers in 2010. Additionally, Wade Phillips has never won a Super Bowl title as a head coach, but he did win a Super Bowl title as the defensive coordinator of the Denver Broncos in 2015. Schottenheimer's son Brian has served as a coach for multiple NFL and college teams since 1997. His longest tenure was with the New York Jets, as their offensive coordinator from 2006 through 2011. In January 2018, the Seattle Seahawks announced that they had hired Brian as their offensive coordinator. Schottenheimer's younger brother Kurt coached for multiple professional and college teams. His first position was as defensive coordinator for William Paterson University in 1974; he then coached for a total of 12 different teams from 1978 through 2012. He most recently served as Marty's successor as head coach with the Virginia Destroyers of the now defunct UFL (this is not reflected in the above tree, which shows only NFL-based relationships). ^ Schottenheimer, Martin (Marty) Archived May 15, 2013, at the Wayback Machine. Pennsylvania Center for the Book. Pennsylvania State University. ^ a b c "Marty Schottenheimer". San Diego Chargers. January 7, 2015. Archived from the original on January 24, 2007. ^ Knight 2003, p. 278. ^ Schneider, Russ (October 14, 1984). "Rutigliano's control is key to his destiny". Cleveland Plain Dealer. p. 2–B. ^ Knight 2006, pp. 299–300. ^ Knight 2006, p. 56. ^ Knight 2006, pp. 58–62. ^ Knight 2006, p. 62. ^ Knight 2006, pp. 93, 95, 98. ^ Knight 2006, pp. 28–29. ^ Knight 2006, pp. 73, 79, 93. ^ Henkel 2005, p. 89. ^ Knight 2006, p. 109. ^ Knight 2006, p. 116. ^ Knight 2006, pp. 116, 118–119. ^ Knight 2006, pp. 121–127. ^ Knight 2006, pp. 128–130. ^ Knight 2006, pp. 131–132. ^ Knight 2006, p. 132. ^ a b Henkel 2005, p. 92. ^ Knight 2006, pp. 166–167. ^ Knight 2006, p. 169. ^ Knight 2006, pp. 173–177. ^ Knight 2006, pp. 178–179. ^ Knight 2006, p. 180. ^ Knight 2006, pp. 181–183. ^ Knight 2006, pp. 211, 215–218. ^ Knight 2006, p. 226. ^ Knight 2006, pp. 228–229. ^ Melvin, Chuck (December 28, 1988). "Schottenheimer Leaves Cleveland". Gainesville Sun. Associated Press. p. 1–C. ^ "Marty Schottenheimer coaching record". pro-football-reference.com. Retrieved January 7, 2015. ^ "Marty's escape route". San Diego Union-Tribune. February 18, 2007. Retrieved September 27, 2010. ^ "San Diego Chargers – Statement from Chargers president Dean Spanos". SignOnSanDiego.com. February 12, 2007. Retrieved September 27, 2010. ^ Acee, Kevin (February 13, 2007). "> San Diego Chargers – Chargers give Schottenheimer the ax". SignOnSanDiego.com. Retrieved September 27, 2010. ^ "The Marty Schottenheimer Effect". National Football League. January 2, 2013. Retrieved January 21, 2013. ^ a b Harris, Joe (October 18, 2012). Marty Schottenheimer Sues UFL Founder. Courthouse News Service. Retrieved October 18, 2012. ^ Robinson, Tom (September 20, 2012). Coach: I won't go 'deep into' reasons for leaving Destroyers. The Virginian-Pilot. Retrieved September 20, 2012. ^ Dale Kasler, Ex-NFL coach fighting owners of defunct Sacramento team over $1 million in back pay, Sacramento Bee (January 14, 2016). ^ Grossi, Tony (October 28, 2016). "Alzheimer's disease won't prevent Marty Schottenheimer from attending 30th reunion of Browns 1986 season". ESPN.com. "Former NFL coach Marty Schottenheimer has Alzheimer's disease". Sports Illustrated. October 28, 2016.